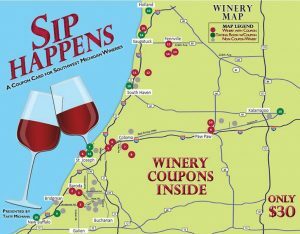 Sip Happens in Southwest Michigan: Tasting Award-winning Wines & Ciders, Beautiful Views! UPDATE: The new 2019 coupon cards are here! Go ahead and check out the savings at wineries, cider tap rooms, and tasting rooms throughout Southwest Michigan. COUPONS ARE VALID UNTIL OCTOBER 31, 2019. We are updating the website over the coming weeks, but in the meantime, feel free to click here and take a look at the brand new card. You can order it online, call us, or email us. Maybe you're just exploring Southwest Michigan on a lazy weekend. Maybe you're looking for a great weekend getaway. Perhaps you are specifically looking for amazing wineries. Whatever your plans might be, we would say that SW Michigan has it all. 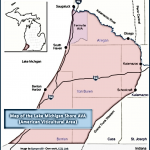 Highlighted by the beautiful Lake Michigan shoreline, starting from New Buffalo, going all the way up towards Saugatuck, then moving about 50 miles inland, is the area known as Southwest Michigan. Visiting Southwest Michigan wineries are quickly catching on as a "must try" for something fun and inexpensive to do. You may have already heard of a few wineries (such as Tabor Hill), but the area is actually loaded with over 30 fantastic wineries about which you may have never heard. Since we've explored most of these great wineries, we'd like to share with you what we've discovered about them. Whether it's tasting the excellent quality of award-winning wines, sampling some of their great food and chocolate, listening to live music, or having a glass of wine while watching a beautiful sunset, we think you'll love it as much as we do. Let us paint the picture for you. You're spending the afternoon traveling through the beautiful, hilly countryside of Southwest Michigan where you can see the many grape vineyards, as well as the plentiful presence of fruit orchards: apples, blueberries, and peaches. You can stop and browse--or pick your own fruit at one of the wonderful fruit farms. At your own pace, you can also visit one of the many picturesque Southwest Michigan wineries where you can taste and enjoy the carefully harvested wines of the Lake Michigan Shore Appellation* (grape-growing region). Imagine yourself sitting in a friendly tasting room, on the winery patio or veranda overlooking the beautiful vineyards. You take in the scenery while sipping your favorite new wine, relaxing, and maybe listening to the live music there that makes you feel so good. This is your chance to breathe, slow down, enjoy conversations or quiet time, relax and enjoy life. The vineyards seem to hold a calming power. What exactly is wine tasting? Simply put, it's tasting wine before you buy. Each of these wineries produce many varieties of delicious wine. You can often choose red, white, sweet, fruity, dry, blends, hard ciders (or any type you want to try) by ordering a "taste" or "tasting flight," which typically consists of small samples of 4-8 different wines. The price of one of these tastings typically range from $5-$20 per person*, often depending on the size of the pour. The advantage of tasting is if you don't find anything you like, you don't buy anything. But if you do, you have the opportunity to buy it right there on the spot. Some wineries also offer the accompaniment of crackers, chocolate, cheese/appetizer plates, or even meals if you wish. You and your friends (or just you) take your own vehicle for tasting at your own pace. There are no seminars, classes, or scheduled presentations; It's just sitting or standing in their tasting rooms, trying the wines with your friends. Stay as long as you want, but a typical wine-tasting will take less than 30 minutes. We recommend choosing a specific, concentrated area of Southwest Michigan so you can visit more than just a couple of wineries per day. You and your group can book a private tour bus; or you can just hop aboard one of the many tour bus options available to the public. Many area cities have pick-up and drop-off locations and times (please refer to the section below). Wine tasting from a tour bus takes you to specific wineries at specific times and ends at specific times. They then drop you off where they picked you up. The winemakers, owners, and their staffs are happy to share their wealth of knowledge about their wines, how they're made, etc. If you want to know about all of that, just ask them - they love sharing their story. If not, just taste your wine, have your own conversations with your friends, and go at your own pace. It's all your choice, so relax, sip, and enjoy. Do you need to be a wine expert to go wine tasting? Not at all! You will need absolutely no wine knowledge to go wine-tasting. Just have fun and find your favorites. Take advantage of sampling these unbelievably good Southwest Michigan wines. This is a great place to learn about wines if that's what you're looking for. Welcoming the arrival of our new 2019 winery coupon card called "Sip Happens!" This $30 card contains valuable coupons, filled with offers from the beautiful Southwest Michigan area wineries, tap rooms and tasting rooms, featuring their award-winning wines and ciders. Come experience the beautiful views, have fun, relax, and enjoy some delicious wine and cider!